First of all, Happy Birthday to my Dad! 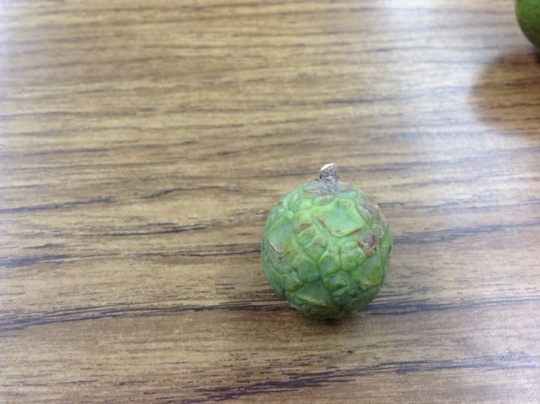 One of my preschoolers brought in some mystery tree fruits. She and her family had been on the campus of the University of Lincoln this weekend for family photos and picked these up.The first fruits were crazy! They were about 3 inches long each. One was like a small pointy green sweet potato and it was attached to a large lumpy green peanut. What they what? It was cool that the seeds were so gigantic inside. The kids had fun trying to get them out – “They’re like teeth!” And yes, they were – you had to wiggle and wiggle them to get them out, and it was totally fun. So here’s the next mystery – what is this? 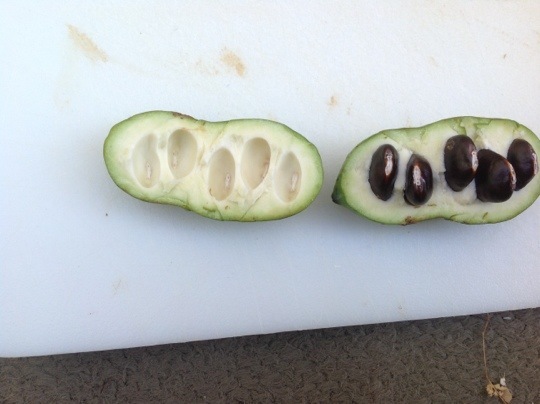 Isn’t there a song in the Jungle Book (movie) that mentions the Pawpaw? Yes. I believe it is “The Necessities of Life”. I don’t know what that other thing is. 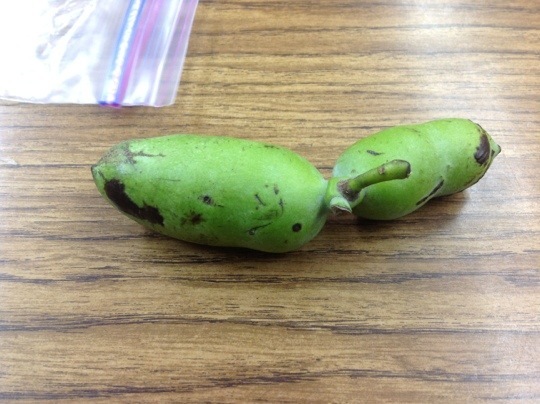 It looks like an immature seed pod or nut to me. Did you slice it open like the pawpaw? Yea, your Pawpaw isn’t golden inside like the one Brad had. Now I’m most curious to try it. BTW: Brad, did you ever acquire a taste for them? And what ever that other thing is….it looks like a shriveled up one! I haven’t acquired a taste for pawpaws. I haven’t tasted them again since my first time. The only place I know to get them is an hour and a half away, and they are only available for a short time in the fall. PS. Could it be a Cherimoya? If it is, I’m really eager to try it. Mark Twain said it is the best or sweetest fruit he ever tasted. Where, o where is pretty little Susie? Way down yonder in the pawpaw patch! I have never tasted a pawpaw. Once, someone tried to get me to taste a banana pepper. Told me it was a pawpaw. I have no clue what the other think is. Osage orange I think. Trees were used to make fence posts once. They say to put them in your house and you won’t have so may bugs. Does it have an odor? Your pawpaw ia called a Missouri banana according to Lloyd. Attn Lauren (or anyone listening): Because you are a master prototyper, would you have any use for a couple of hundred 5 inch jar openers. If you’re working on something on a table that’s sliding around, putting one underneath fixes it. Ha! But what will I do with my other two hands jar openers? To answer the other questions: I didn’t open the other seed yesterday and forgot to today, so I hope it’s not dried up and unopenable tomorrow. I’ll keep you posted.